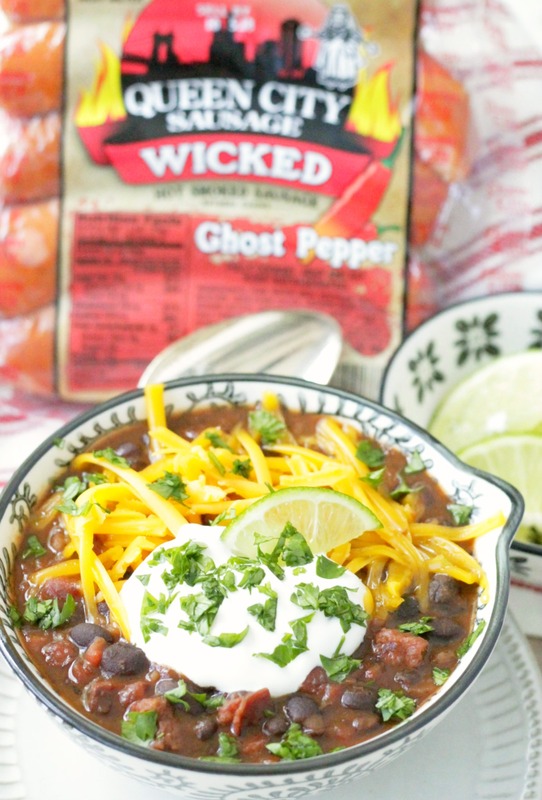 Unbelievably flavorful with well-balanced spice and made with locally owned and operated Queen City Sausage – you have to try this Wicked Black Bean and Ghost Pepper Sausage Soup. Thank you to Ohio Pork for sponsoring this post, all opinions are mine alone. What do you think of when you hear ghost pepper? I used to think pain. I’ll readily admit that until I got to my 40’s my tolerance for peppers and hot sauces was wimpy. I think with age my taste buds may have dulled a bit. Plus I’m just more adventurous in my eating overall. So I can stand some heat without getting out of the kitchen now so to speak. On a recent tour of Queen City Sausage here in my hometown of Cincinnati, Ohio some blogger friends, pork farmers and I were treated to a lunch of sausage stir fry and Wicked Sausage Kabobs (made with their relatively new Wicked Ghost Pepper Smoked Sausage). Apparently hot lunches at this locally owned, American success story of a company are every day fair. 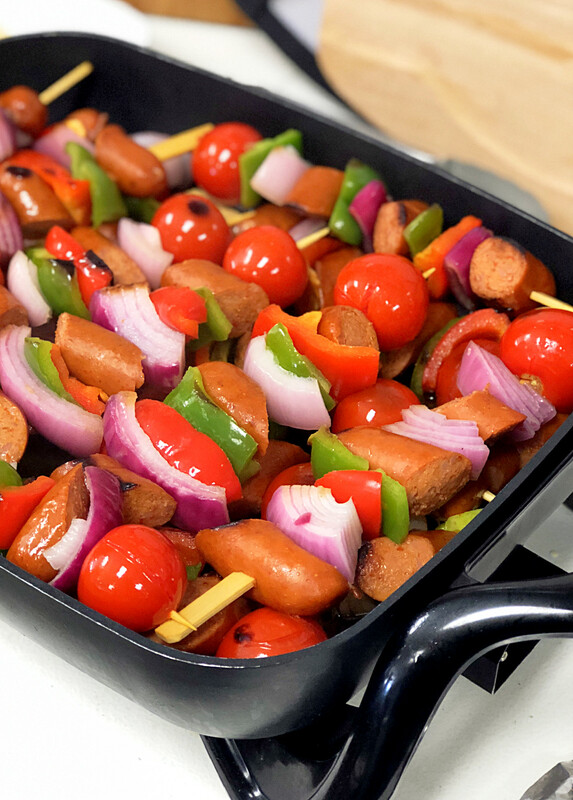 I have to admit the stir fry was my favorite that day but just look at these beautiful kabobs! 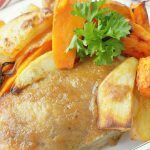 Simply basted with a little Italian dressing and Worcestershire sauce – they are pleasing to the eye and tasty to eat. However the large chunks of ghost pepper smoked sausage were just a wee bit much for my wimpy palate. Which is funny because there are folks out there that add even more heat to them – like a mustard made with ghost peppers. But it really wasn’t that I didn’t enjoy eating the ghost pepper kabobs. I could still taste the Queen City spice blend and fresh meaty taste, plus the in-house smoke flavor that has made them famous – despite the burn from the ghost pepper powder that is mixed in. I just needed to tone down the heat a bit. 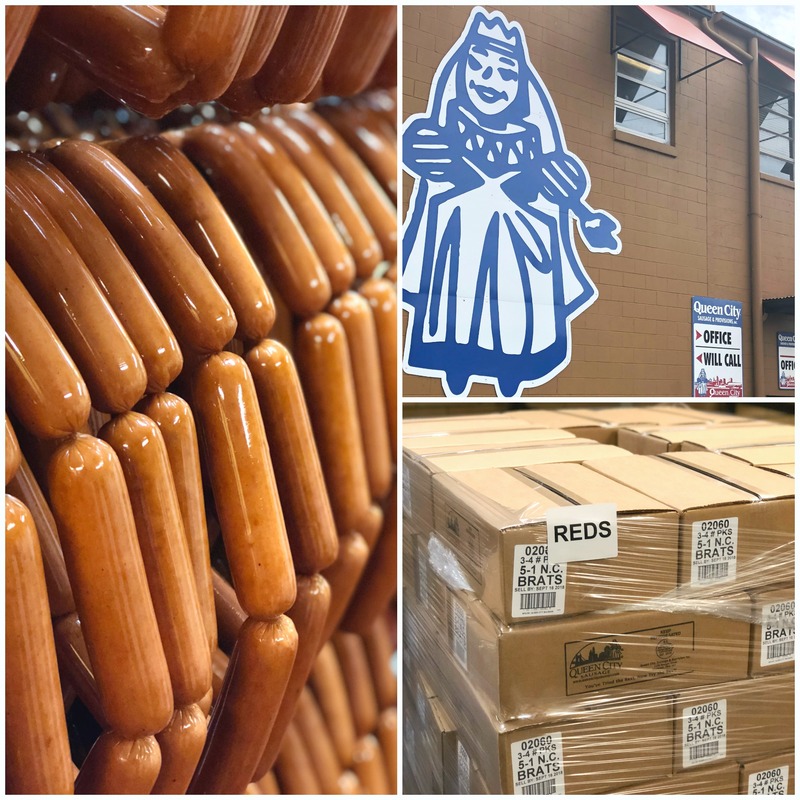 We were sent home from our tour with Queen City products to enjoy – Goetta, hot dogs, brats and another pepper flavor from their new Wicked line – the Jalapeño Smoked Sausages. 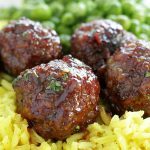 But I really wanted to create a recipe using the Ghost Pepper sausages to prove that anyone can enjoy them – not just the folks whose palates can take ALL the heat and still want more. So I present to you with great excitement this Wicked Black Bean and Ghost Pepper Sausage Soup. I’ve made a lot of soups over the years and I have to say this is one of my all time favorites. It doesn’t take a lot of extra ingredients for seasoning because so much flavor is brought to the pot thanks to the Queen City Sausage. And by the way, each batch of sausage has its flavor thanks to Art, the 86 year old brother of Elmer, the 88 year old owner of the company. They both show up to work every day! Queen City’s owner Elmer Hensler quit school in the 8th grade to work in the slaughter houses of Cincinnati and eventually opened his own sausage factory in 1965. Cincinnati was known as “porkopolis” back then, with over 50 sausage factories within the city limits. Today only one remains – Queen City Sausage – with Elmer still at the helm. 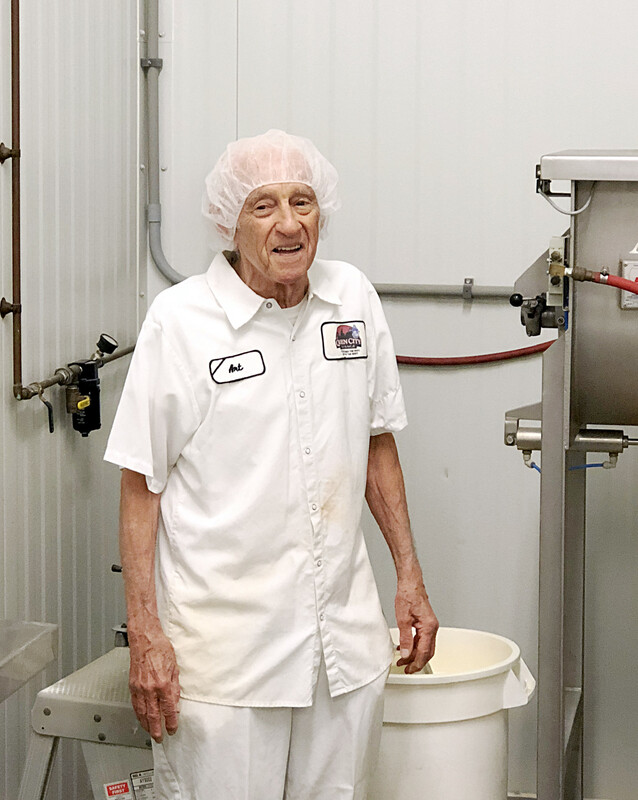 And his brother Art (after retiring from his other job) as one of the many dedicated employees showing up to make their line of locally sourced sausage products every day. If you like more heat, add more sausage links. This recipe calls for 2 links. Add 3 for more heat and meaty flavor. Brown the chopped ghost pepper sausage before cooking the rest of the soup – this helps to bring out the flavors of the Queen City Ghost Pepper Smoked Sausages even more. 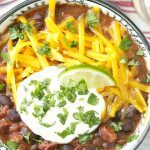 Topping the soup with sour cream is optional, but it helps to mellow the heat if you are more on the wimpy end of liking spice in your food, like me. This soup can be served as either an appetizer or as a full meal. 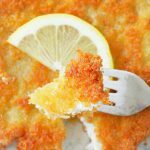 For a full meal add a slice of cornbread or garlic bread and a fresh green salad. I used a pot like this one to cook this soup. Unbelievably flavorful with well-balanced spice and made with locally owned and operated Queen City Sausage - you have to try this Wicked Black Bean and Ghost Pepper Sausage Soup. In a food processor or blender, blend together about 3/4 cup of the black beans with one cup of the chicken broth. Set aside. In a large soup pot, melt the butter over medium high heat. Add the chopped ghost pepper sausage links to the pot. Cook for about five minutes, stirring occasionally, until starting to brown. Stir in the garlic, salt, smoked paprika and cumin. Cook for about one minute, until garlic is fragrant. Add the drained tomatoes, the black beans, the blended bean and chicken broth mixture, the remaining 2 cups of chicken broth and the bay leaf. Bring the soup to a low boil. Reduce heat to simmer and let the soup simmer until starting to thicken, about 20 - 25 minutes. Remove the bay leaf from the soup. Stir in the fresh lime juice. 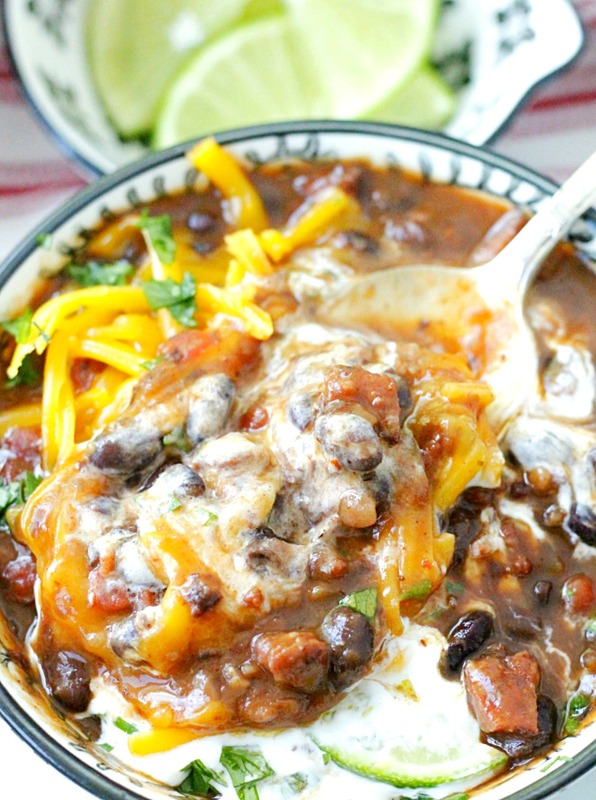 Top each bowl of soup with the chopped fresh cilantro, shredded cheddar cheese and sour cream. Looks so rich and delicious! 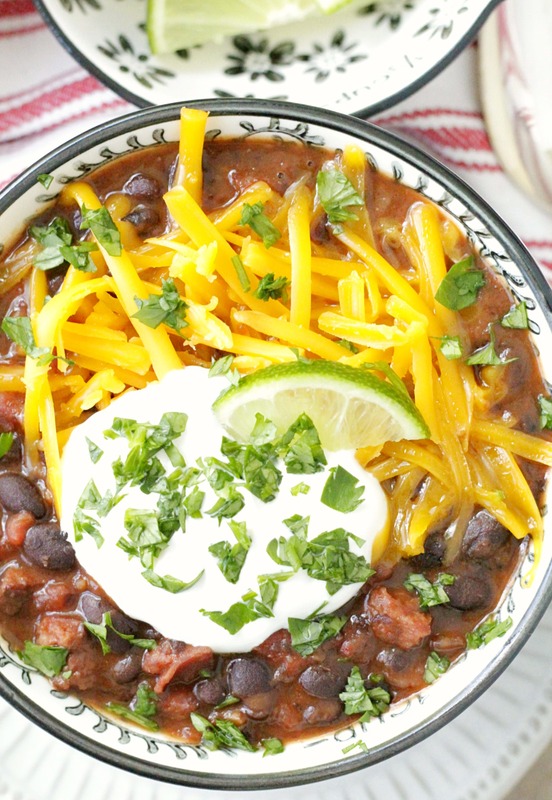 Comforting and simply perfect as a hearty dinner or lunch! Awesome. Add all you want! Glad to hear it. Thanks for commenting! That sounds delicious, I have no problem with heat in recipes although it very much depends on the application and surrounding flavours rather than just the heat of the chili itself. There are always limits 😉 But I’d love to give these a try! Yep totally agree. Heat just for heats sake is just overkill. This is total comfort food for me. I am so excited for autumn and these kind of meals.